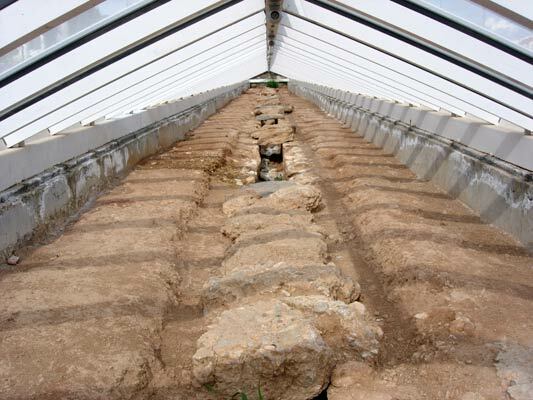 Excavations within the site of the Olympic Village have unearthed remains of what is known as Hadrian's Aqueduct. Work was begun on this project in 125 AD, by order of the philhellene Emperor Hadrian, and completed fifteen years later (140 AD), during the reign of Antoninus Pius. 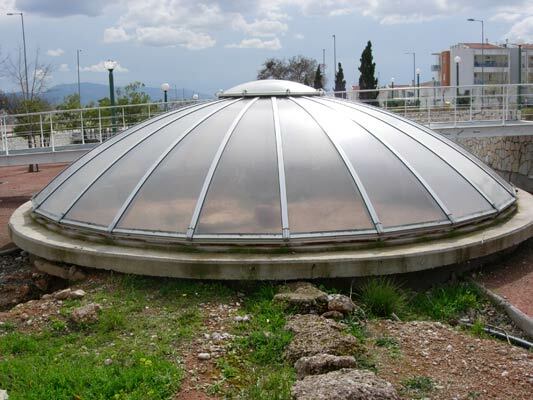 It was a work of vital importance for Athens, which had always suffered from a lack of water. Hadrian's Aqueduct was fed from springs on Mount Parnes and crossed the Attica basin (Maroussi, Nea Ionia, Nea Philadelphia, Ambelokipi), to a reservoir on Lycabettus Hill. It supplied Athens with water until the 1920’s when the Marathon Dam was built. After that, the Aqueduct gradually dwindled into an irrigation channel, until it was finally phased out entirely at the end of the 20th century. 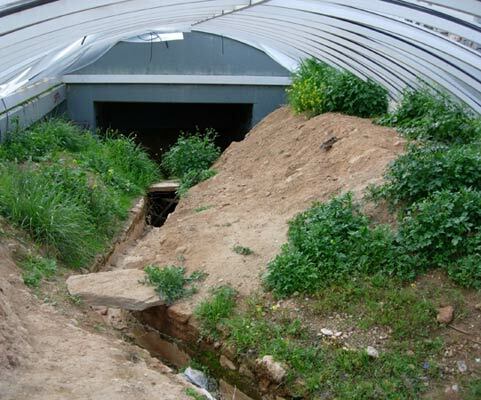 Each time a water supply organisation took over the exploitation of Hadrian's Aqueduct, the last ones being the corporations ULEN, EEY and EYDAP, extensive cleaning operations, repairs and other interventions were carried out. 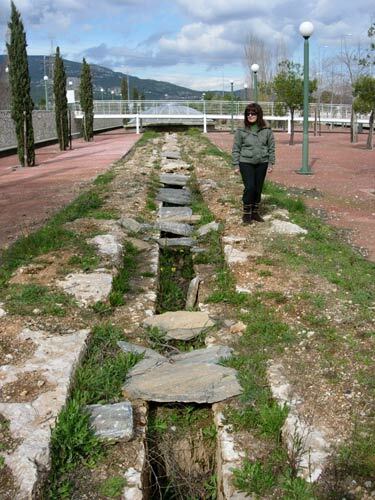 Following the route of Hadrian's Aqueduct within the Olympic Village, as it stands after the most recent interventions, we see two separate surface conduits emerging from two different locations on Mount Parnes. One of these, which runs NE-SW, joins the other, which runs N-S, from which point the now single conduit continues on southward. In about the centre of the Olympic Village the surface conduit bends sharply downwards and disappears underground. 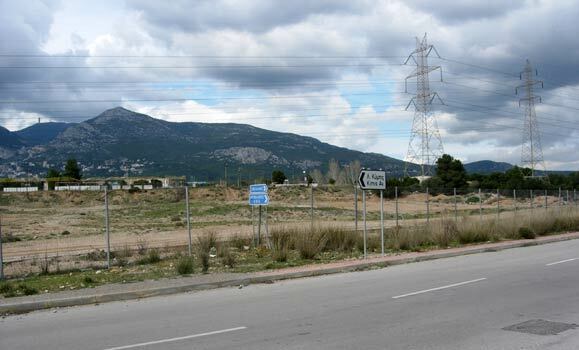 Its route from this point on is marked by shafts constructed at regular intervals, until it clears the Olympic Village. Two secondary underground branches, similarly marked by shafts, converge with the central conduit at the point where the system goes underground. One of these runs NE-SW and is parallel to the first surface channel mentioned above. 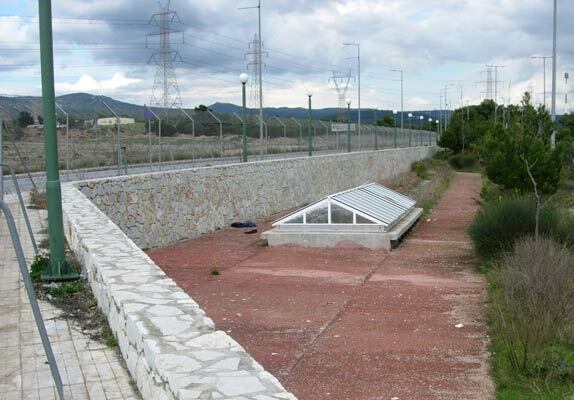 The other runs E- W.
Different construction methods and materials were used in the building of the Aqueduct. The surface conduit is a masonry structure forming a trough in the shape of an inverted “Π” 40 cm wide. Its walls (approximately 60cm high by 30 cm thick are built up of rows of virtually undressed stone stuck together with mortar. The bottom of the trough is formed of a layer of compacted stone, covered with a hydraulic lining that also covers the trough walls. Centuries of use have left thick salt deposits on the bottom of the trough and the lower part of the walls. 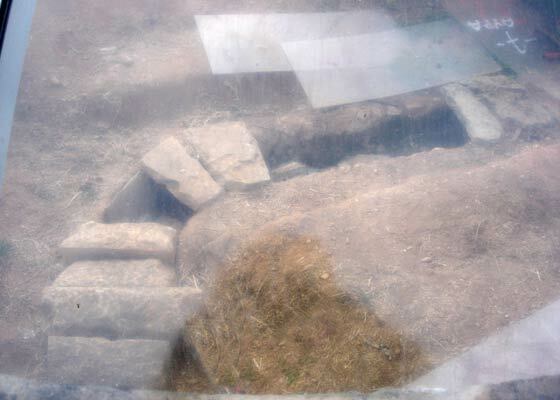 The trough has an average depth of 60 cm and is roofed over with slabs of local stone or slate. The underground sections of the aqueduct were constructed, in the customary Roman fashion, as tunnels either built up of masonry or hewn out of the rock, depending on the hardness of the ground. 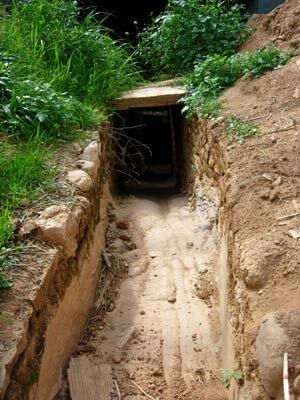 This work was facilitated by the construction of open shafts at regular intervals, to accommodate the movements of men and materials within the tunnel. Once the tunnel construction work was complete, these shafts were used for the inspection and repair of the Aqueduct. 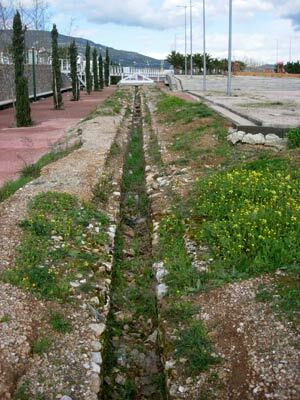 Hadrian’s Aqueduct was located and excavated within the framework of the construction of the Olympic Village. The rehabilitation of the monument is designed to preserve it and integrate it into the everyday life of the local community. For centuries, Hadrian’s Aqueduct was a work of vital importance for Athens. Its construction was initiated by the Roman emperor Hadrian in 125 AD, and was completed in 140 AD. It started in the region of the Helidonou ravine (Helidonou river valley) and ended at Dexameni area, just below Lycabettus. 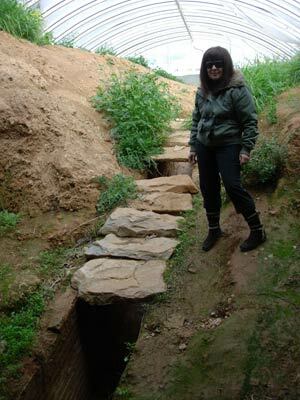 During the period of Turkish rule, the aqueduct fell into disuse. In 1856, there were many systematic efforts, in order to put it back into operation. 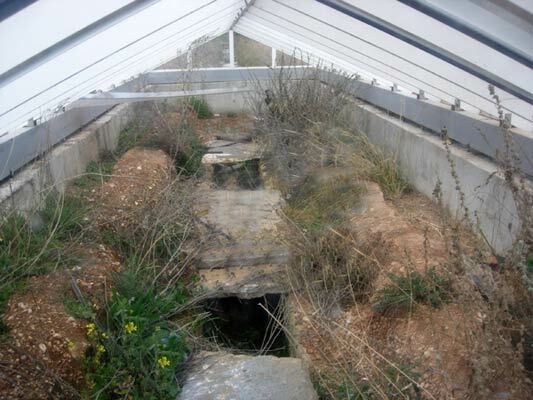 In 1879, in the north part of the main tunnel, a duct was discovered, which was oriented toward the northwest, and which went as far as the -dilapidated at that time- Dimoglis home on the Acharnes plain. South of this house there was a number of small auxiliary wells in the direction of the Menidi olive grove. In 1900-1901, under mayor Spyros Mercouris, Hadrian’s Aqueduct was cleared on a total length of 15 km from the site of Dimogli’s Estate and its north side was extended, a project that was completed in 1904. The capital “had been quenching its thirst” from this aqueduct until the early 1930s. 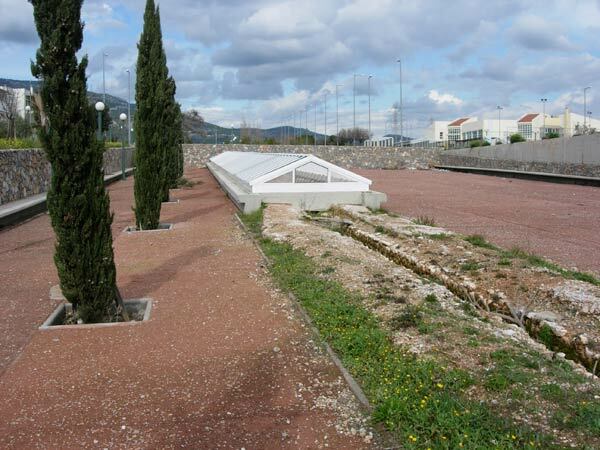 As a token of respect for the historic nature of the region, it was decided to restore the findings from Hadrian’s Aqueduct, which adorns the public spaces of the Olympic Village. 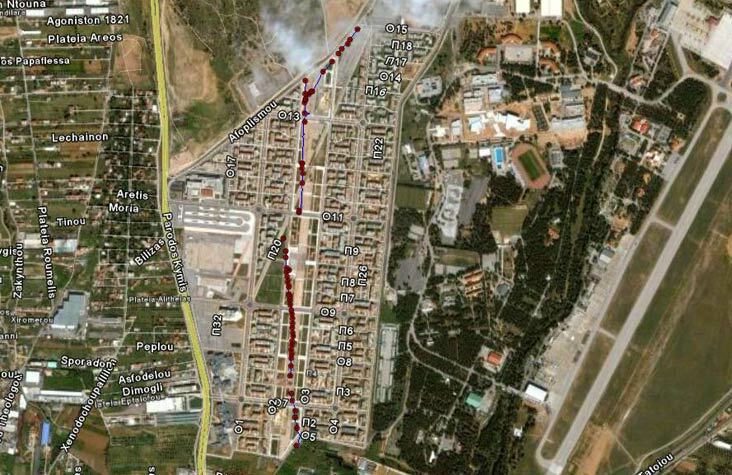 GPS recorded positions of aqueduct access points (red) and channels (blue) (RJH - 13th February 2009). 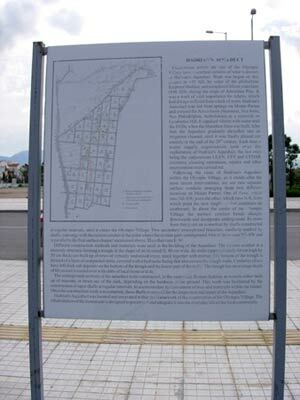 See the Maps section for a map showing all visible & buried access points to the aqueduct. 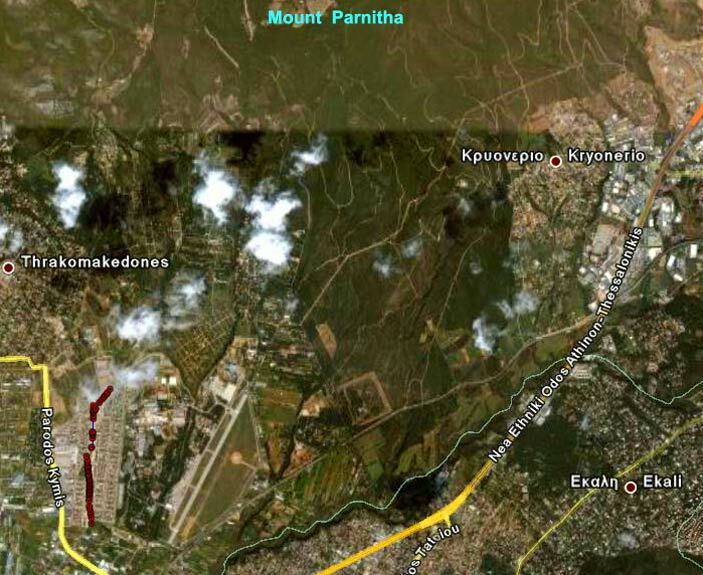 Showing the aqueduct (red) in relation to Mount Parnitha from where the water originated. RIGHT: The channel just before it goes underground. Note the limestone deposits on the channel floor - from 1,500 years of operation. Some sections of the channel are covered to protect & display them. 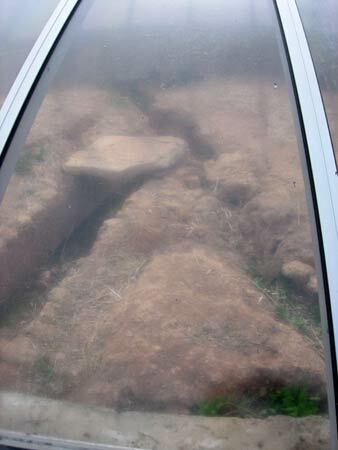 Under the canopy - showing the slabs of rock used to cover the surface channel. Another section using slates to cover the channel. Canopy covering the point where two channels bringing water from 2 different sources converge. A northern section of the easterly surface channel. Under the canopy the channel can be seen to be making a sharp turn to the north. (possibly a join with another channel). This channel then continues in it's original NE direction. near the top left-hand end the Olympic Village. Under the canopy - dressed stone covering for the channel. View across the road to Mount Parnitha - the source of the water.... somewhere?